This week, Cisco made some announcements regarding UC&C licensing with Rel 9.0. 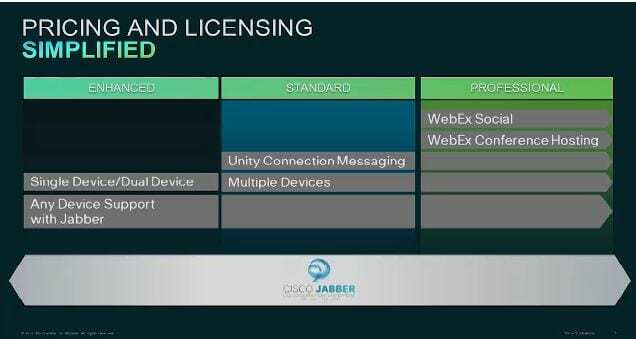 The company is offering three levels of licensing, and all levels have access to Cisco Jabber, and Pro users get WebEx Social. Enhanced: Now includes any device, including Jabber and softphones. Single Device/Dual Device. Standard: Multiple Devices, unity Connection Messaging (previously known as Unified Workspace Licensing Bundle). Professional: Includes WebEx Social (previously Cisco Quad) and WebEx Conference Hosting. Simpler yes, my only question is why is the base level called ‘Enhanced’ (enhanced from what)? Two other noteworthy changes: Tying licenses to hardware devices is going the way of the Cius. Cisco’s UC offerings can now be managed and deployed as a software platform. While many will still choose to start with a hardware phone, don’t feel obligated. Cisco is perfectly happy to see users choose devices, like a PC, a tablet or even a smartphone as their main communication and collaboration tool. Also, Cisco now offers Enterprise Licensing Manager (ELM) for no charge. This application gives customers (and partners) improved visibility of licensing usage.